Question 1. 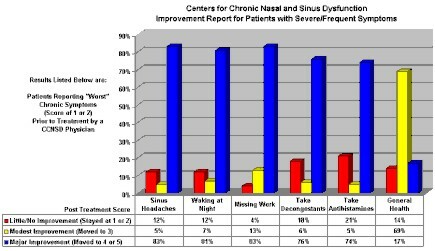 After your treatment/ On a scale of 1 to 5, how would you describe sinus headaches? Question 2. After your treatment/ On a scale of 1 to 5, how would you describe waking up at night? Question 3. After your treatment/ On a scale of 1 to 5, how would you describe missing work or other activities? Question 4. After your treatment/ On a scale of 1 to 5, how would you describe taking decongestants? Question 5. After your treatment/ On a scale of 1 to 5, how would you describe taking antihistamines? Question 6. After your treatment/ On a scale of 1 to 4, how would you describe your general health? 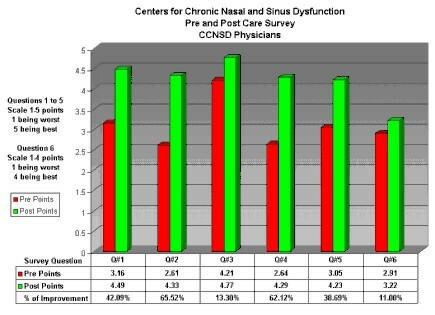 The information and graphs above show the data collected from a random sample of laser treated patients, consisting of 582 patients receiving care from one of 42 participating physicians. The "pre" portion of the survey was conducted by phone and prior to the patient having their first visit with a participating study physician. The "post" follow-up survey was conducted by phone 90 to 120 days after the laser procedure was performed. Patient results shown are not offered as a basis for you having the procedure, they are ONLY an indication of the results actually obtained as reported by the patients studied. As with all health care decisions, only a complete diagnostic work up with a qualified and trained physician may reveal what you may be suffering from and whether or not you are a candidate for the laser procedure or other treatment and what results you can expect. We are concerned about the quality of "internet" medical advice and self-diagnosis by internet users � no amount of research can replace the opinion of a qualified physician who has examined you, for your individual needs.